GUANTANAMO BAY NAVAL BASE, Cuba A military tribunal reconvenes Tuesday for five men charged in the Sept. 11, 2001 terror attacks, but the defendants may sit this session out. The judge presiding over the case has ruled, over the objections of prosecutors, that the defendants have the right to be absent from a weeklong pretrial hearing in a case considered one of the most significant terrorism cases in U.S. history. A lawyer for one of the five says he expects his client will not be there, while attorneys for the other men said they weren't sure what would happen, and that the men would likely wait until the last-minute to decide, as the judge has given them the leeway to do. "They have the right to come to court or they have the right not to come to court, that's what the judge decided," James Connell, a lawyer for defendant Ali Abd al-Aziz Ali, said after Monday's ruling. The chief prosecutor, Army Brig. Gen. Mark Martins, had argued that the rules for the special war-time tribunals known as military commissions required the defendants to attend all sessions of the court at the U.S. Navy base in Cuba. But lawyers for the men disagreed, and said the threat that they could be forcibly removed from their cells would be psychologically damaging for men who had been brutalized while held during their captivity by the CIA in secret overseas prisons prior to being taken to Guantanamo in September 2006. "Our clients may believe that ... 'I don't want to be subjected to this procedure that transports me here, brings up memories, brings up emotions of things that happened to me,"' said Jim Harrington, who represents Ramzi Binalshibh, accused of helping to provide support to the hijackers who crashed planes into the World Trade Center, Pentagon and a field in Pennsylvania on Sept. 11, 2001. Harrington's statement elicited groans from a small group of family members of Sept. 11 victims who were chosen by lottery to come to Guantanamo to view the proceedings. A few other families watched the proceedings on closed-circuit TV from U.S. military bases in New York, New Jersey, Massachusetts and Maryland. In the end, the judge, Army Col. James Pohl, ruled that the defendants didn't have to attend the rest of the weeklong session, which was called to hear arguments on 25 pretrial motions on preliminary legal issues that must be addressed before their eventual trial, likely more than a year away. His questioning of the defendants brought a rare light moment to the proceedings. The judge told each man that the trial would go on without them if they were to somehow escape from the remote and high-security Guantanamo prison, drawing a smile of disbelief from Binalshibh. "I'm escaping from custody?" he said in English. The same question prompted some sarcasm from Al-Aziz Ali, a Pakistani citizen accused of funneling money to the hijackers. "I'll make sure to leave some notes," he said in English. Connell said his client was likely consulting with the other defendants before deciding whether to attend the session. David Nevin, lawyer for self-proclaimed terrorist mastermind Khalid Sheikh Mohammed, said he also was unsure of his client's plans. Navy Cmdr. 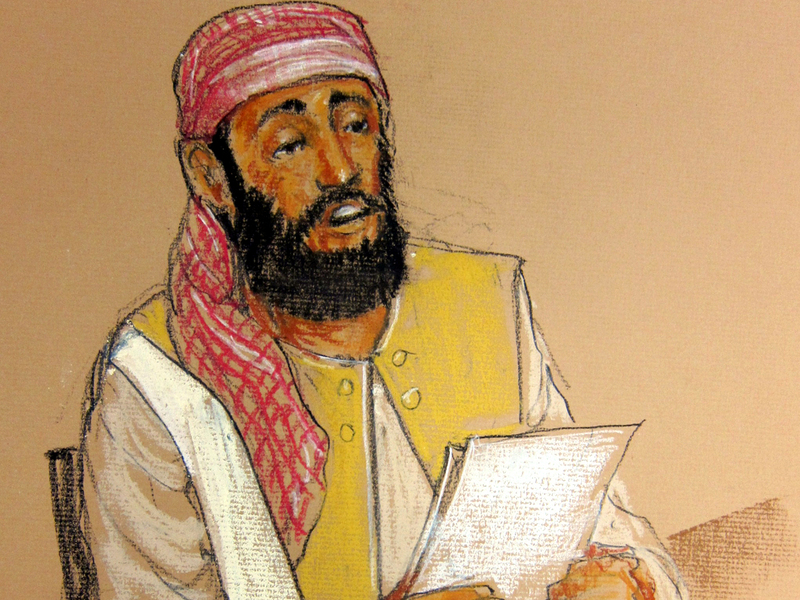 Walter Ruiz, the Pentagon-appointed military lawyer for Mustafa Ahmad al-Hawsawi, said he doubted his client would show up to the hearing. The judge is expected to begin hearing arguments Tuesday on broad security rules for the case, including measures to prevent the accused from publicly revealing in testimony what happened to them in the CIA prisons. Prosecutors have asked the judge to approve what is known as a protective order intended to prevent the release of classified information during trial.